Spacious, comfortable, and close to Everything! 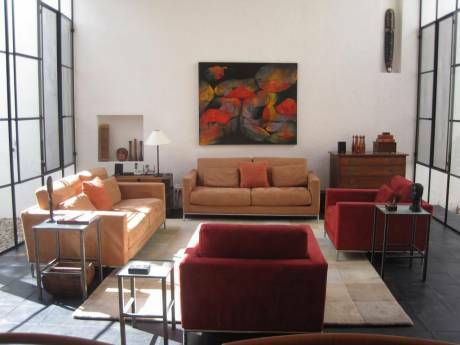 I love my big, beautiful, casual house in San Miguel de Allende! It is a Hacienda style house. It is comfortable, and friendly. It loves when you invite friends to dinner in the ample dining room. 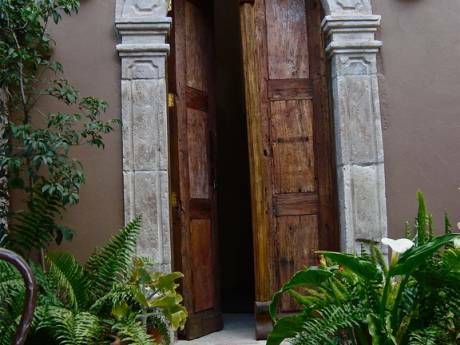 It loves when you have breakfast or drinks outside in the courtyard, surrounded by flowers, with birds chirping in the tree. You can walk to dozens of restaurants, hundreds of shops, language schools, artisan market, rambling markets with produce, flowers and everything else! There are two queen bedrooms, one en-suite, the other has a bathroom, but not attached. There is an extra twin bed in the upstairs sala or sitting room, for the occasional guest or for a child. I can easily get another twin bed for you if you need it. I would make the art studio into a bedroom with studio! The kitchen is large, with a 6 burner gas range with oven, a microwave oven, toaster, blender, refrigerator/freezer, and good cooking utensils. There is no dishwasher. There are ample dishes, etc for 10 to eat together. One great big room is waiting for you to paint a masterpiece! I did not include pictures of it. It is just simply a big, bright work room off the upstairs sitting room. There is a flat screened TV in each bedroom. There is WiFi, cable TV, and the cleaning lady will visit once or twice a week. The gardener will come once a week. I hope you will water whilst we exchange, because it may be warm and sunny every day, and the plants will need watering. PLEASE NOTE: I posted pictures of several properties I own. If simultaneous exchange will not work for you with my house, perhaps one of the others will be vacant at the time you wish to visit SMA, and if so, I will trade that instead. So I included pictures of the other properties, and you can request more information if you like. I am 65 and retired. I have never smoked. I want you to know that I have built a few houses, and have been a home-owner for over 40 years. I will take excellent care of your property, and will not let your plants die, or a leak go undetected. I ask for a clean house to live in, and will keep it clean. Your property will be in as good or better shape when I leave as it was when I arrived. I lived my whole life in California, US. In 2006 I decided to travel around Mexico and choose a place to live. I love to feel I am living an adventure, and now that Mexico has become "normal" to me, I need to travel more. I came here in part to pursue my love of art, and to dabble and learn more. My first foray into the 'art' world was to paint little metal frames/boxes, called nichos, that are made here in San Miguel. I put Barack Obama in them (I was so thrilled he had been elected), and called them 'Obama Boxes'. They were a big hit! I had a blast. Now I am looking for more adventure. I spent 3 months in Europe in 1990 and always expected to go back "soon". But never did. In 1990 I exchanged with 2 different people, and it was a great experience. One exchange was an apartment in the heart of Paris, the other was in the center of Vienna. That was before the Internet, so making arrangements was quite different than it is now. In those days I lived in a suburb of San Francisco. 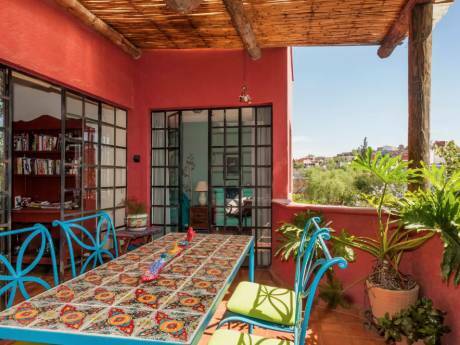 Let me tell you, San Miguel de Allende is much more exciting! What I am looking for: I am willing to exchange for as little as 2 weeks or as long as 4 or 5, if the location calls for it. I won't have a car (unless you loan me one), so I need to be in a good, central location. Somewhere near public transportation and restaurants, museums, galleries, etc. I do not want to be in rural, suburban, or industrial areas. I assume I will be traveling alone, but would like to be allowed, if there happens to be room, to invite a friend to join me now and then along my travels. San Miguel is an artist colony, and my neighborhood, which is called Colonia Guadalupe, is an artist colony within an artist colony. I will make sure to introduce you to my friends in the neighborhood so you have a head start. Prepare to make lots of new friends! Prepare to walk and site-see all over town, because it is just beautiful. We have an organic market and restaurant in Col. Guadalupe, and the best art supply store in all of SMA. There are little local restaurants and grocery stores all around, and a 15 minute walk puts you in the middle of town where there are more restaurants, and shopping than I can describe here. If you like folk art, you will LOVE the artisan market, which runs for a few blocks through centro. If it is fine art you prefer, there are galleries galore! We are only 10-15 mins walk to the Fabrica la Aurora, where dozens of very good artists have galleries and studios.